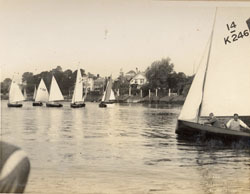 The Twickenham Yacht Club, still flourishing today, was originally founded in Richmond in 1897. 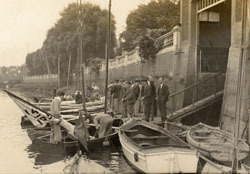 In fact, boating and sailing for leisure purposes only really became possible, between Richmond and Teddington, after Richmond's Half Tide Lock opened in 1894. This provided navigable water all hours of the day and meant a yacht club, based on the reach, could be sustained. The Club was formed as the Swan Sailing Club, with the first meeting held at the White Swan Inn, Old Palace Lane, Richmond, in 1897. The Club derived its burgee (the small triangular flag flown on its boats) from the inn sign, a swan, originally on a red background. Shortly afterwards, in 1900, a new club (The Richmond Sailing Club) arose out of the remnants of the earlier club, using the same burgee. The headquarters were then the White Cross Hotel, Richmond, and later at the Three Pigeons in Richmond. Between 1910 and 1912 a dispute arose and many stalwarts of the Club marched out of the old club into The Phoenix, in Orleans Road, Twickenham, to continue as before. The name of the Club reverted to the Swan Sailing Club, but with a burgee of a white swan on a blue background. Meanwhile, another club, The Twickenham Sailing Club, had met for some time at the White Swan, Riverside, Twickenham. In 1916, The Phoenix was closed under the Compensation Act and the Swan Club had to give up its clubhouse and it moved to the White Swan in Twickenham. It was therefore natural for the two clubs, meeting in the same premises, to merge and this is what happened. The meeting place was in the balcony room and the club re-started racing in 1919, after the First World War had ended. In the years following the First World War, with gradually increasing membership, the need for a proper clubhouse was felt. Then in 1924, Twickenham Council purchased York House, which included a boathouse that was empty. 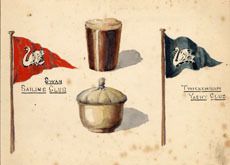 In December 1924, the Club moved in and changed its name to the Twickenham Yacht Club. The newly leased boathouse, built over a wet dock, contained three fine rooms, storage and a yard to accommodate storage of around fifteen craft during the winter. The mooring and docking facilities were subsequently greatly improved and a companionway was built that led from the dockhouse to the pontoon moored under the river wall of York House. The enabled the pontoons to be used at any state of the tide and further moorings were built for cruising and other sailing craft. The Club now entered a very successful era. It took a leading part in the river pageant held on 11 Sep 1926 to celebrate Charter Day when Twickenham became a Borough. During the Second World War many members joined the forces, whilst older members, or those on essential war work, joined the River Emergency Service. All boats had to be registered and have their numbers painted on the bow and their engines immobilised. In 1940 two boats, "Omega" and "Black Arrow", were sent down to Sheerness or Ramsgate in connection with the Dunkirk Evacuation. Another boat "Mirasol" belonging to a member also went across and like "Black Arrow" was never to return. After the Second World War further improvements continued to be made, including a lower deck to the clubhouse, purchase and lease of additional dinghy parks and an extension to the clubhouse. Open Days are now held regularly to encourage new members. Today the Club is still flourishing after more than 100 years. Thanks are due to David and Elizabeth Wood, Pip Deverson and the Commodore and members of the Twickenham Yacht Club for information supplied and for permission to use pictures from the club archive.